Handmade with pride in Australia. Cole Clark guitars have a bold sense of self in terms of design and materials, and their guitars have a consistency of personality that is the hallmark of all great instrument makers. 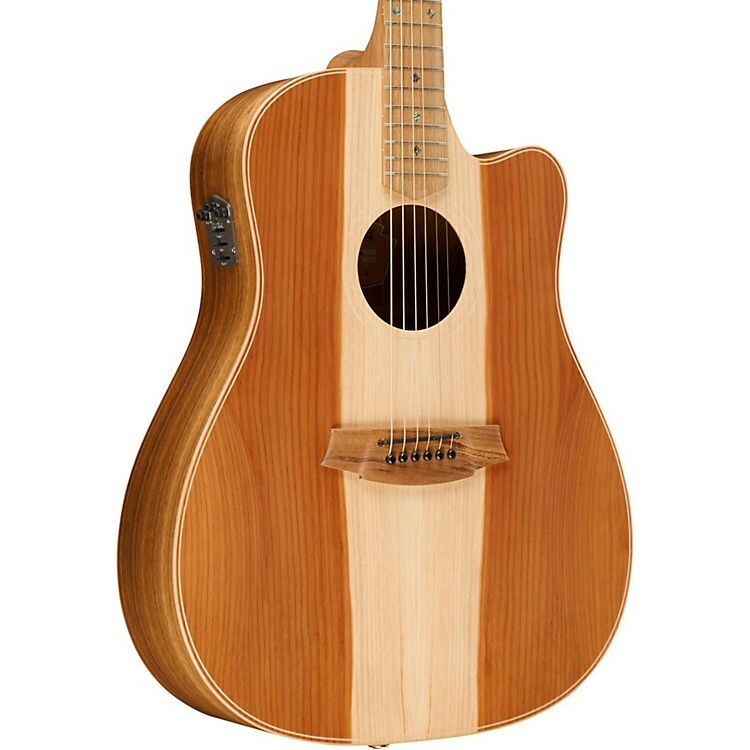 The materials used in creating the Fat Lady 2 Series Australian Eco Redwood/Blackwood Dreadnought Acoustic-Electric Guitar are sourced from abundant Australian tree stocks, and those groves are tended with care for replenishment. Cole Clark employs classical construction methodologies alongside innovative design and manufacturing techniques to produce a lighter, stronger guitar with a completely natural sounding pickup. An Australian-grown redwood top and Australian blackwood back and sides combine to create a broad, warm acoustic guitar sound that will charm any fan of quality guitar sound. The Queensland maple neck is sure and steady, comfortable to play. Please note that Queensland maple isn’t even related to American maples. This is an unusual wood that lends itself extremely well to guitar building, especially in neck construction. Note also that the redwood top is soft and warm, and not the greatest choice for guitarists who use percussive techniques on their acoustic guitar top. Its pickup system is truly spectacular, with six individual piezo sensors underneath the bridge saddles that provides excellent string separation and clear, round, warm response across the lower frequency spectrum. The piezo sensors can be blended with Cole Clark’s patented Face Sensor, a magnetic sensor mounted to the top of the guitar, and integrated into the top bracing, specifically designed to optimize the midrange frequencies of the instrument. There is additionally a built-in condenser microphone that has no response below 2.4 kHz, so as to avoid any possibility for that low, woofing feedback that condenser mic systems encounter in stage environments. You can dial in the amount of microphone response you want with a rotary knob, so as to fill in the sparkle and complexity of the upper-end harmonics. There is a three-band slider-style EQ as well, which, when used in conjunction with the patented 3-way pickup system, allows you to dial in just the nuance you’re after. Great for recording. Australian-grown American redwood. Australian blackwood. Queensland maple. These aren't your father's guitar woods. Order one soon.